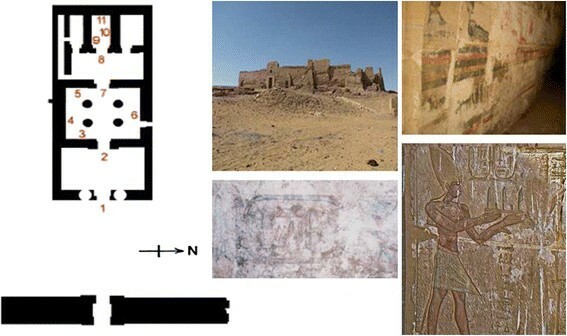 In the present work, a multi-analytical approach was used to analyze samples collected from the wall paintings of Qasr el-Ghuieta temple, Kharga Oasis, Egypt. The temple is dating back to the 27th dynasty (525–404 BC) and was completed during the Ptolemaic period. The samples were analyzed by optical microscopy (OM), environmental scanning electron microscopy (ESEM) coupled with an energy dispersive X-ray analysis system (EDX), Raman microscopy and Fourier transform infrared–attenuated total reflectance spectroscopy (FTIR–ATR). The chromatic palette used in the temple was identified as Egyptian blue (cuprorivaite), red ochre (haematite), yellow ochre (goethite) and carbon black (from a vegetable origin). The green pigment was identified as green earth, however, a green tonality was also obtained through a mixture of Egyptian blue and yellow ochre, and in some samples, carbon black was also found. Several amounts of anatase and carbon black were found in the red and yellow ochre samples, respectively. The analysis showed that the preparation layer is almost made of pure gypsum, while the plaster layer based mainly on gypsum with variable amounts of quartz, calcite and clay minerals. The results showed that the painting materials and techniques used in the temple are almost the same of those used in the Egyptian temples with respect to the stratigraphy of paint layers, chromatic palette and the painting technique employed. Kharga Oasis is located to the west of the Nile valley, about 550 km to the South of Cairo. Kharga, is the largest oasis of the Libyan desert and consists of a depression (about 160 km long and 20–80 km wide) (Bliss and Osing, 1985). Kharga Oasis was an important transit point for the desert caravans since the 12th dynasty (c. 1786–1665 BC) . The largest and best preserved site at Kharga Oasis is the temple of Hibis from the Persian period (c. 660–330 BC), located about two kilometres to the north of the modern city of Kharga. During the Christian period, some of the old temples and forts in the oasis were converted to churches and monasteries . Qasr el-Ghuieta temple is located about 18 km in the south of Kharga city. The temple is dating back to the 27th dynasty (525–404 BC) and was completed during the Ptolemaic period. In 1972, A. Fakhry cleared the temple and some buildings in front of the temple were found. These buildings show extensive damage from fire and the destruction probably dates to the time of the Blemmyes in the 5th century AD . In more recent years, a series of excavations inside and outside the walls of the temple were undertaken. The work outside has focused on two areas; the first has been around the south east corner of the fort (mostly Roman period remains). A variety of houses and related structures were unearthed with a few Greek ostraca, a Demotic ostrakon, and pottery. The second area outside the walls was the "quay" structure directly east of the gate. Some authors suggest that Qasr el-Ghueita temple in its present form dates back to the reigns of Darius I and Ptolemy III, with additional texts and scenes added by Ptolemy IV Philopator and Ptolemy IX Soter II. The work of the Theban Desert Road Survey (by Yale Egyptological Institute in Egypt ) at el-Ghueita temple has revealed that the central rear chamber of the temple, decorated in both painted plaster and raised relief carving under Darius I, incorporates within it a small, formerly freestanding sandstone shrine of some date prior to the Twenty-Seventh Dynasty. In general, the temple comprises four sections: a forecourt, a hypostyle hall with four columns, a vestibule, and three inner chambers, of which only the centre room bears decoration. On the façade and jambs of the entrance portal to this central sanctuary are scenes and inscriptions of Ptolemy III Euergetes I in a sunken relief . Inscriptions on the door jambs of the sanctuary and forecourt, state that Ptolemy III Euergetes I built both the columned hall and the temple forecourt. The temple, dedicated to the Theban triad of Amun, Mut and Khonsu, is entered through a sandstone gate on the southern side of the enclosure walls. Figure 1 shows a general view of the temple, some wall decorations and detailed plan of the temple. General view of the temple, some wall decorations and detailed plan of the temple. (1). Entrance of the temple; (2). Facade and entrance to the pillared hall; (3). Inscriptions of Ptolemy III, Amun Re, Khonsu, and Mut; (4). On the south wall, scenes of Ptolemy III, Montu, Horus and Hathor; (5). In the west wall, Ptolemy IV Filopator followed by his wife, Maat, Amun-Re seated on the throne and Amonet standing behind him; (6). In the north wall, scenes of Ptolemy X Soter II making offerings to the Theban triad of Amun-Re, Mut and Khonsu; (7). On the outside edge of the door to the lobby, Ptolemy III and Berenice before the Theban triad of Amun-Re; (8). At the entrance of the shrine, scenes of Ptolemy III, Berenice II immediately before the Theban triad; (9). Sanctuary (Dynasty XXVII), on the side walls of the sanctuary (9)-(10) are the remains of two similar scenes, and only painted in pretty poor condition showing left, and Darius offering an image of Maat, in front of a row of deities and right offering two vessels in a row deities other than the above, and on the back wall of the sanctuary (11), made in relief, but it destroyed in some places to the right, you can see King Darius I in offering an image of Maat, the triad: Amun, Mut and Khonsu. The analysis of painting materials is considered an integral part of any pre-restoration research. In case of wall paintings, paint analysis usually begins with visual observation, for the purpose of locating representative areas for analysis. The optical microscopy helps in gathering information about the thickness and sequence of paint layers, colour and texture of those layers . In order to study the morphology and chemical composition of the samples, scanning electron microscopy is usually used and the elemental microanalysis by SEM–EDX is always a valuable preliminary orientation . Raman spectroscopy is a micro-analytical technique achieved several advantages in analysis of ancient painting materials. It has been successfully applied to study ancient Egyptian pigments and wall paintings -. This technique is non-destructive because little sample preparation is required or no sampling in case of micro-Raman . Raman analysis is particularly suitable for the identification of pigments in complex matrixes and inorganic pigments in artworks -. The objectives in Raman microscopy allow the laser radiation to be focused on a 1–3 μm spot typically in the visible region (in the infrared, the spot size is 10 μm and over), which is particularly useful for the identification of specific components in heterogeneous mixtures. In Fourier transform infrared–attenuated total reflectance spectroscopy (FTIR–ATR), the sample is in direct contact with the crystal that allows the infrared radiation to penetrate through the sample many times. This is due to the crystal having a high Refractive Index causing the infrared radiation to be bounced back many times. The use of ATR eliminates, in many cases, the need for sample preparation or at least simplifies the procedures. In general, many studies have been devoted to characterize materials dating back to the Roman age from different sites around the world, some of these materials are pigments -, mortars -, and plasters . In contract of this, few studies were undertaken to study materials from Ptolemaic and Roman monuments in Egypt -. For this, the mean aim of the present work was to study pigment and plaster samples collected from the temple of Qasr el-Ghuieta, Kharga Oasis, Egypt using different analytical techniques. The obtained data will allow a comparison between wall paintings from the late period and Ptolemaic age with those from the Pharaonic age. As a result of the deterioration factors affecting the site (mainly salt weathering), the wall decorations are suffering from exfoliation and several detachments. A total number of eleven samples (with approximate dimensions 1×1.5 to 2×2.5 cm) were carefully chosen for analysis. Also, some grains (a few milligrams) from the well preserved decorations were carefully scraped off the painted walls with a metallic scalpel. In order to get information on the startigraphy of the paint layers (mainly the blue paint layers due to the size of samples), cross-sections were prepared prior to analysis by optical microscopy and ESEM, the samples were embedded in Epoxy resin (EpoFix), cross-sectioned using variable silicon carbide papers and DP-lubricant blue for fine and cool polishing, and mounted on glass slides. Preliminary observations on the samples were performed using an Olympus SZ-40 stereomicroscope (10 and 20× objectives) equipped with an Olympus DP10 digital camera. Optical observations on the cross-sections were carried out using an Olympus BX60 in reflection mode (with optical magnifications 50× to 500×) equipped with a JVC KY-F1030 digital camera. The optical images were captured in the reflected light which helped in identifying the structure of the paint layers and the colour of certain individual pigment grains. The prepared thin-sections of the plaster samples were examined by a Nikon Eclipse E600 microscope with photographic PixeLINK PL-A623 digital camera. The microstructure and microanalysis of the studied samples were analyzed by environmental scanning electron microscope model Philips XL-30 ESEM. This equipment is a field-emission source, offering a wide range of operating conditions, in which specimens can be examined with high chamber pressure environment. The X-ray microanalysis was carried out using an EDX detector (in a EDAX, Apollo SDD 10) with 20 Kv accelerating voltage and pressure of 3.0 Torr. EDX data acquisition was obtained through GENESIS 6.x software. Microanalysis of single pigment grains down to 1 μm, as well as of the matrix and the total average of the paint layer were performed. Also, some polished cross-sections were investigated. Raman spectra were recorded using a Renishaw InVia Raman spectrometer in the near infrared excitation line (785 nm) of a diode laser source. The instrument is equipped with Peltier cooled charge coupled device (CCD 576x400 pixels). A Leica DMLM microscope with a XYZ motorized stage with 200 and 500 magnification objectives was equipped to the Raman spectrometer which helped in providing a sample irradiation diameter of up to 1 μm. A polarized unit system is mounted onto the microscope which offers a clear view of the area under investigation, necessary for positioning the beam on individual pigment particles. The lower laser powers (up to 0.5 mW) were used to avoid inducing thermal changes to the mineralogy of the iron oxide minerals. Typical exposure time of the CCD was 20s per scan, while normally 5 up to 20 accumulations were co-added to produce the final spectrum in order to improve the signal-to-noise ratios. 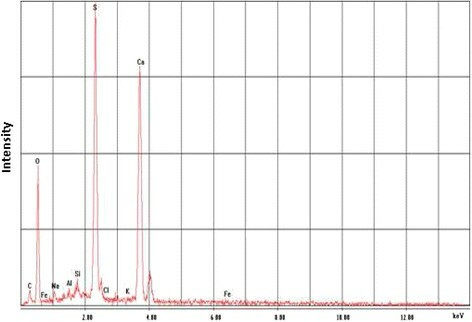 FTIR–ATR spectra were collected on a Perkin Elmer spectrometer 400 equipped with an ATR (attenuated total reflectance) detector using a diamond cell in the wavelength range of 4000–650 cm−1, at a spectral resolution of 4 cm−1 over 32 scans. A background of the clean diamond cell was performed for each analysis undertaken. The diamond cell requires only minute amounts of sample material. Also, spectra were recorded by contacting the ATR crystal directly onto the polished surfaces of the mounted cross sections. Table 1 summarizes the results obtained from different analytical techniques employed to study the samples. - Under reflected light: coarse heterogonous crystals (30 μm in length) with dark blue colour are observed. - Thickness = 100-200 μm. - It appears as pale blue probably due to the white binding medium (gypsum). - Dark blue and yellow grains are observed, black grains can be seen in some areas. - Several voids are spread on the surface and black grains are found. - Thickness = 30 μm. - The surface is slightly compact with red and black grains within the paint layer. - Thickness = 30-70 μm. - Thickness = 2–4 mm. - The sample filled with angular particles. *Blue and green pigment samples showed strong fluoresce when excited at 785 nm. Bold element indicates correlation with the main pigment mineral. Figure 2 shows microscopic images (under the reflected light) obtained on the blue and green paint layers. The microscopic examination of the blue paint layer shows deep and light blue crystals spread within a transparent matrix (Figure 2a). The green paint area shows various shades with blue and yellow-orange particles scattered in the matrix. The green particles are pale, rounded and translucent with some exhibiting of grainy texture (Figure 2b). The optical examination of the yellow pictorial layer shows small and rounded grains of the pigment and the hue is affected by impurities found in the layer. Also, the examination shows black and red grains (up to 30 μm length) scattered on the surface. The red paint layer shows deep brown to reddish hues with dark particles in the layer. Optical photomicrographs of: (a) blue pigment sample (microscope objective 50× magnification, under reflected light), (b) yellow pigment sample (microscope objective 20× magnification, under reflected light). Figure 3 shows an ESEM image and element distribution map obtained on polished cross-section of the blue paint layer. The ESEM image showed the slightly thick paint layer with heterogeneity in its components. The major elements distributed in the section were silicon, calcium and copper, corresponding to the mineral "cuprorivaite" (CaCuSi4O10), a synthetic pigment first prepared in ancient Egypt in the 3rd millennium BC. In Figure 4, the ESEM images obtained on the outer surfaces of the paint layers are present. The ESEM image obtained on the outer surface of the green pigment sample (Figure 4a) shows an idealized light grey crystal of cuprorivaite. The spot microanalysis obtained on individual crystal in the sample indicates that the predominant elements are silicon, calcium and copper. Other elements detected were of aluminium and potassium with high concentration of iron. This confirms that Egyptian blue was mixed with iron oxides to obtain a green tone. In Figure 4b, fine grains with slightly coarse grains are dispersed within the matrix. The EDX microanalysis showed that calcium, silicon, aluminium, magnesium, potassium and iron are the main elements in the sample. The absence of copper in the green pigment sample excludes the use of copper-based compounds and confirms that green earth (Terre Verte) was used as the green pigment. ESEM investigation of the red paint layer (Figure 4c) shows the heavy weathered pigmented layer due to salt weathering. The fine granular particles of the ochre can be observed. The EDX microanalysis of the sample showed a high concentration of silicon together with a strong peak of iron indicating the existence of iron oxide as the possible material producing the red colour. Calcium, sulphur, aluminium, sodium, potassium were also detected. For the yellow pigment, the ESEM image (Figure 4d) shows slightly fine grains of the pigment material. Black grains centred in the image are clearly noticeable. EDX microanalysis obtained on the sample shows the presence of iron together with minor amounts of aluminium and silicon as in the red pigment sample. This could be due to the existence an aluminosilicate material (e.g. clay minerals which could be primary accessory minerals in ochre pigments). Spot microanalysis of the black grains in the sample showed high concentration of carbon suggests the presence of carbon black probably added to produce special hues or tonalities. The investigation of the black pigment (Figure 4e) shows fibrous structure in the middle of the image surrounded by components of the underlying preparation layer. EDX microanalysis shows a sharp C peak with medium and low signals corresponding to the presence of silicon, calcium, aluminium, sulphur, sodium, chloride, magnesium, iron and Ti from the plaster layer beneath. The absence of phosphorus in the EDX microanalysis suggests that the black carbon was obtained from burnt vegetal matter. The investigation of the plaster sample in the red painted fragment shows fine grains of the preparation layer together with few large quartz grains (Figure 4f). The EDX microanalysis of the sample revealed high concentrations of sulphur and calcium confirming the presence of phases of calcium sulphates as major component in the sample. The preparation layer showed almost same composition of the plaster sample since signals of Ca, S and O were also detected (Figure 5). Different proportions of Si, Al, and K were also detected. ESEM image (in the backscattered electron mode) obtained on a polished cross-section of the blue paint layer (350×, scale bar = 200 μm) and an element distribution map shows silicon, calcium, copper and sulphur are present. 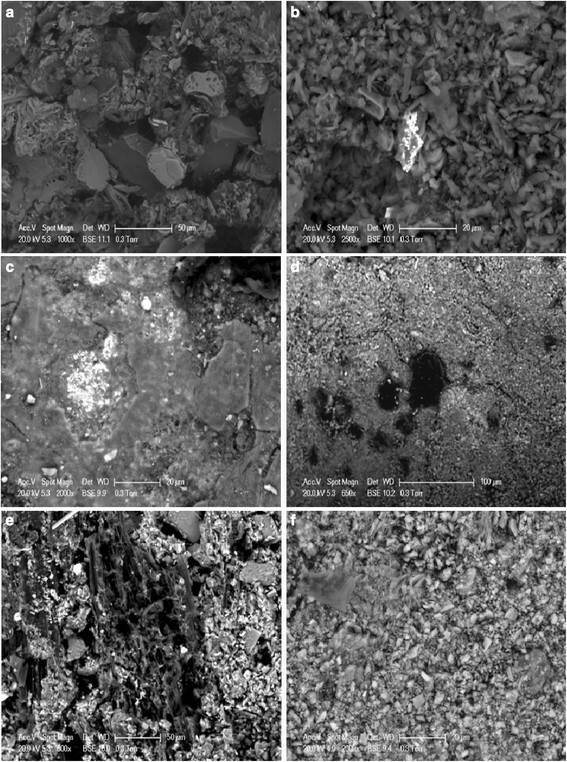 ESEM images obtained on the outer surface of the studied samples, (a): green pigment, bright grey crystals of cuprorivaite are observed (1000×, scale bar = 50 μm), (b) iron oxides are observed in the green pigment sample (2000×, scale bar = 20 μm), (c) red pigment sample and the fine grains of haematite are observed (2000×, scale bar = 20 μm ), (d) yellow pigment, fine grained goethite are observed and carbon black are centred in the image (650×, scale bar = 100 μm), (e) black pigment, the fibrous structure of a vegetable matter can be observed (800×, scale bar = 50 μm) and (f) the plaster sample (2000×, scale bar = 20 μm). An EDX spectrum obtained on the plaster layer. Figure 6 shows some Raman spectra collected on the pigment and plaster samples. Thanks to the microscopic unit attached to Raman instrument, spectra were recorded on individual grains in the paint layers. The Raman spectrum of the red pigment (Figure 6a) represents typical peaks of haematite (α-Fe2O3) at 226, 298, 417 and 614 cm−1,. Moreover, the strong band at 417 cm−1 indicates a well-crystallised haematite . The band at 147 cm−1 is characteristic of titanium dioxide phase anatase which can be a contaminant in natural iron oxide deposits. A light tone of the red colour was identified as a mixture of haematite based on the bands at 224, 299, 414 and 617 cm−1 and gypsum with the characteristic [SO4]2− stretching mode at 1007 cm−1 , and a weak band at 1136 cm−1. The Raman spectrum of the yellow pigment (Figure 6b) shows bands at 395, 305 and 557 cm−1 for goethite (α-FeOOH). The Raman spectrum recorded on black grains in the yellow paint layer (Figure 6c), shows bands at 1383, 1481 and 1578 cm−1 are due to carbon black. The Raman spectrum recorded on the black pigment (Figure 6d) contains two characteristic broad bands for carbon black centred at 1345 and 1583 cm−1. Raman analyses detected no band at 960 cm−1, the wave number of the stretching of the phosphate ion [PO4]3−, so the presence of ivory black and bone black one may be excluded. This indicates that carbon was obtained from a vegetable origin. In the case of blue pigment samples, the pigment fluoresced very strongly when it was excited at 785 nm. For this, the identification of the blue pigment samples was based on ESEM–EDX and FTIR–ATR analyses which indeed confirm the presence of cuprorivaite. The Raman spectrum obtained on the preparation layer (Figure 6e) showed the presence gypsum bands at 423, 500, 1009 and 1134 cm−1. The plaster layer showed quartz with its characteristic Raman band at 466 cm−1 and the band of gypsum at 1009 cm−1 (Figure 6f). Raman spectra recorded on pigment and plaster samples, (a): red pigment (haematite) (0.5 mW, 5 scans of 20 s), (b): yellow pigment (goethite) (0.5 mW, 5 scans of 50 s), (c): black grain in yellow pigment (carbon black) (0.1 mW, 10 scans of 20 s), (d): black pigment (carbon black) (0.1 mW, 10 scans of 20 s), (e): preparation layer (gypsum) (1 mW, 10 scans of 20 s), (f): plaster layer (quartz + gypsum) (1 mW, 10 scans of 20 s). Figure 7 shows FTIR–ATR spectrum recorded on the blue pigment sample. The blue pigment sample showed a strong fluorescence using 785 nm Raman, the FTIR–ATR spectrum recorded on the pigment shows characteristic peaks in the region 1000 and 1050 cm−1 are attributed to Si − O − Si stretching vibrations. In this region, Egyptian blue gives raise to a typical triplet bands, mean ones at 998 and 1045 cm−1 and low intensity bands at 1159 cm−1. For the green pigment, the following bands arise at: 3695 cm−1 (Al---O–H str. ), 3553 and 3393 cm−1 (O–H stretching); 1106 and 1004 cm−1 (in-plane Si–O stretching modes) and 799 cm−1 (R–O–H bending, where R is the octahedral ion −Al, Fe+2, Fe+3, Mg). These bands are attributed to green earth. 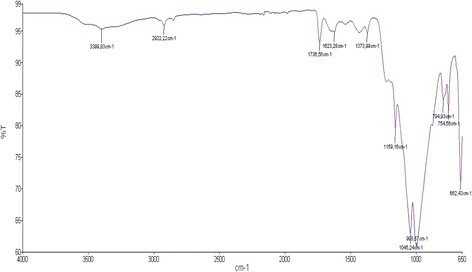 The FTIR–ATR spectra recorded on the preparation layer show typical absorption bands of gypsum at 3529, 3401,1682,1620,1104 and 668 cm−1 and the band at 1414 cm−1 is due to calcite. Moreover, the contribution of the quartz is probably corroborated for the appearance of the band at 783 cm−1. The band at 3430 cm−1 is due to free hydroxyl ions of kaolinite (a clay mineral usually associated to ochre pigments), peaks of water H–O–H str., and a broad peak at 3140 cm−1 which was attributed to the peak of hydrated ferric oxide. Bands at 3697, 3668, 3653 and 3620 cm−1 indicative of OH stretching vibrations along with the OH bending vibrations at 935 and 915 cm−1 suggest that the clay present is kaolinite. FTIR–ATR spectrum obtained on the blue pigment sample. The blue pigment was identified as Egyptian blue. The earliest recorded use of this pigment was in the IVth Dynasty (2613–2494 BC) and its use lasted throughout the dynastic period and continued on into the Roman period. For the Ptolemaic-Roman period, we have a description of the manufacture of a blue pigment, which is clearly Egyptian blue frit, given by Vitruvius (at the beginning of the 1st century BC). In addition, there is the production debris resulting from the manufacture of Egyptian blue frit at the site of Memphis, near Cairo, that dates to somewhere in the period from 3rd century BC to 3rd century AD . The optical examination on the blue paint layer showed a think pigmented layer with dark blue crystals scattered across a glassy background. For light blue areas, diluted blue is used to describe the colour of fine-textured Egyptian blue that has a large amount of glass formed in its composition, which masks the blue colour and gives it a diluted appearance. Under microscope light, and due to the white binding medium, the colour of such layers is always pale blue. The macroscopic impression however may be more intense blue. In addition, the artist probably wanted a light blue shade for this particular part of the decoration, in which case he has diluted the pigment in more white binder. From the ESEM–EDX analysis, major elements of Si, Ca and Cu were detected and FTIR–ATR analysis confirmed the presence of cuprorivaite. No Raman bands were recorded for the blue pigment samples using our spectrometer (785 nm laser). Egyptian Blue, upon excitation in the visible and NIR, exhibits strong fluorescence emission with a maximum at about 890 nm . Red and brown grains were observed in the blue paint layers, it is suggested that red ochre was added on purpose to the blue pigment to produce special hues. In his study of blue pigments from the Ptolemaic temple of Hathor at Thebes (decorated in the third century by Ptolemy IV and enhanced by Ptolemy VI and also by Ptolemy XI), Marey Mahmoud , showed that the blue pigment was identified as Egyptian blue and the micro X-ray fluorescence analysis revealed significant quantities of lead in the glass phase suggesting that a leaded bronze scrap was used to produce the pigment. On the basis of ESEM–EDX and FTIR–ATR data, the green pigment was identified as green earth (Terre Verte), also, a green tonality was obtained through a mixture of Egyptian blue and yellow ochre. Such a technique of obtaining green, which appeared sporadically during the XIIth Dynasty (1991–1786 BC), became much more widespread during the Amarna period (1370–1352 BC) . The optical observation under microscope was sufficiently enough to confirm this process since residues of the original blue and yellow pigment grains are clearly observed. Many authors have reported the detection of green earth pigments in Roman wall paintings in Egypt; in their study of the chromatic palette of the Dakke temple at Nubia dating back to the 2nd BC century Frommold et al. , reported that the green pigment was of basic copper chlorides (atacamite, CuCl2Cu(OH)2), but they claimed that they were not able to decide whether it is the originally used pigment or a secondary product of a deterioration process. The red pigment was identified as red ochre (haematite). Pigments made from ochre are often discovered as long-lasting colourful remains in archaeological contexts. Raman bands recorded on the red pigment showed that a well-crystallised haematite is used. In the Raman spectrum of the pigment, anatase was detected; the most obvious possibility of the detection of this mineral is its simple presence already in the natural geological materials. Both rutile and anatase have been found by other authors in red pigment samples . Red ochre was found combined with carbon black to produce tonalities of dark red and brown. Pigments made from ochre are often discovered as long-lasting colourful remains in archaeological contexts. In the Egyptian wall paintings, ochre pigments were widely used without interruptions from the 5th Dynasty (c. 2494–2345 BC) till the Roman period in Egypt.The yellow pigment was identified as yellow ochre (goethite) (with minor quantities of clay and quartz). Raman bands recorded on the yellow pigment showed that a well-crystallised goethite was used. The black pigment was identified as carbon black. 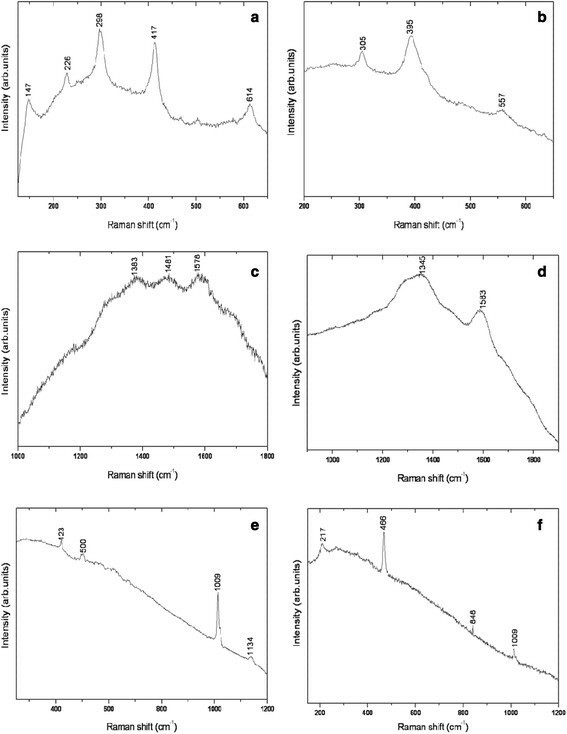 Since the characteristic band of [PO4]3− was not detected in Raman analyses and no phosphorus was found in the ESEM–EDX analysis, it is possible to exclude the animal origin of the pigment. Black pigments of vegetable origin have generally been made from various kinds of charred plant matter, mostly wood, but also leaves or seeds; the charcoal formed during the charring process is then washed, to remove soluble matter, and finally ground to powder . The analysis of black pigments from the Ptolemaic baths in front of Karnak temples complex, revealed the detection of bone black . Bone black is one of the oldest pigments known to humans, and was originally made by charring animal bones. From ESEM–EDX, micro-Raman and FTIR–ATR analyses, gypsum was identified as the main component of both the preparation and plaster layers. Many authors studied samples from wall paintings in pharaonic temples in Upper Egypt, for example: the temple of Seti I in Abydos, the 19th dynasty, c. 1293–1185 BC) , and they have reported that the decorations of these temples were applied in thin layers on a preparation layer consists of gypsum, as it was common in this period of time. FTIR–ATR analysis on the pigment samples showed the spectra are consistent with a proteinaceous material (amide II vibration at 1541 and 1578 cm−1). The absence of carbonyl bands at c. 1730 cm−1 suggests the presence of a proteinaceous material (probably animal glue). In most of samples, the content of animal glue was not confirmed because the amide I and II bands are masked by the broad bands of calcium sulphate, oxalate and carbonate. Further analysis using gas chromatography mass spectrometry (GC/MS) will be useful to identify the proteins in the sample. From this, we suggest that tempera technique was employed in the decorations of the temple. In this study, the complementary use of optical microscopy, Raman microscopy, FTIR–ATR and ESEM–EDX mapping on micro-samples allowed direct identification of the minerals contained in pigment and plaster samples collected from wall paintings of Qasr el-Ghuieta temple, Kharga Oasis, Egypt. The results showed that the pigments used were Egyptian blue (cuprorivaite), red ochre (haematite), yellow ochre (goethite) and carbon black (from a vegetable origin). The green pigment was identified as green earth (Terre Verte), and a green tonality was obtained through a mixture of Egyptian blue and yellow ochre, and in some samples, carbon black was also found. In particular, Raman microscopy was really helpful for identifying individual grains in both the pigment and plaster samples. Several amounts of anatase and carbon black were found in the red and yellow pigments, respectively. The analysis showed that the preparation layer was made of gypsum while the plaster samples consist of quartz, gypsum, calcite and clay minerals. No significant differences were found between the wall decorations of Qasr el-Ghuieta temple, Kharga Oasis, Egypt and those applied in the Pharaonic temples, and their chemical composition and stratigraphy are almost the same. The findings of this study are in accordance with previous analyses of ancient Egyptian pigments, which indicate the continuous use of artificial and natural earth pigments. The results will be used in the conservation–restoration interventions regarding these decorations. The author is grateful to Mr. Alain Tonetto, Pôle PRATIM, Faculté des Sciences, Aix-Marseille Université for ESEM investigation.